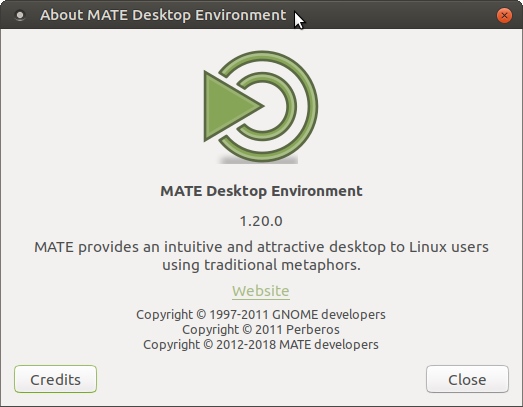 After 11 months of development the MATE Desktop team are pleased as punch to announce the release of MATE Desktop 1.20. We’d like to thank every MATE contributor for their help making this release possible. The theme for this release has been stabilising the MATE Desktop by replacing deprecated code and modernising large sections of the code base. We’ve also improved our window manager (Marco) and added support for HiDPI. Along the way we’ve fixed hundreds of bugs. Squished ‘em dead! MATE Desktop 1.20 supports HiDPI displays with dynamic detection and scaling. HiDPI hints for Qt applications are also pushed to the environment to improve cross toolkit integration. Toggling HiDPI modes triggers dynamic resize and scale, no log out/in required. Marco now supports DRI3 and XPresent, if available. Frame rates in games are significantly increased when using Marco. Marco now supports drag to quadrant window tiling, cursor keys can be used to navigate the Alt + Tab switcher and keyboard shortcuts to move windows to another monitor were added. Support for Global Menu providers such as vala-panel-appmenu has been added. MATE Panel has much improved Status Notifier Items (SNI) support. Bookmarks now support GTK3+ locations. MATE Terminal now supports background images, adds Solarized themes and keybindings to switch tabs. Atril, the document viewer, has had a massive overhaul and is better in every single way. Yes, all ways. Better! In particular accessibility support for visually impaired users is considerably improved. Caret navigation has been added. The Invest applet has been dropped from MATE Applets. The API, provided by Yahoo, has been discontinued and there is no reputable drop in replacement available. Panel applets now size correctly based on the units being displayed and many graphs are dynamically scaled. Engrampa, the archive viewer, has improved support for encrypted 7z archives. MATE Sensors Applet (finally) supports udisks2. OpenBSD authentication is supported in MATE Screensaver and minizip in Atril supports more BSD variants. A-n-d for distro maintainers we’ve bumped the minimum GTK3+ and GLib requirements. GTK 3.22 and GLib 2.50 or newer are required to build MATE Desktop 1.20. Here are all the gory details. added feature: present the size on disk of files as we present the size of the file. search: added tag support (xattr::xdg.tags). Fix broken rename in list view by selectin file name cell. Forces a window scale of 1 for the window manager, instead of using the default or user configured scale. systemd user-session needs to be updated to get all user-defined enviroment when the session starts. dbus needs to be updated to get all user-defined environment when the session starts. Forces a window scale of 1 for the panel, instead of using the default or user configured scale. Implement OpenBSD authentication using bsd_auth(3). libview: Pre-cache some prev/next pages to the current page range. libview: Added ‘cursor-moved’ signal to notify when the caret cursor has been moved. libview: Text selection using the caret cursor. libview: Notify about caret navigation errors using the error bell. libdocument: Add remove_annotation to DocumentAnnotations. pdf: Add activation link for Fields that have it. Take monitor scale factor into account when calculating zoom. Add hi-dpi support for main view. Rounding error in draw corrected. GSettings for checkmark color shown for mounted volumes. Mounted drives will show a little bit different icon. stickynotes: create parent dir for stickynotes-applet.xml if it does not exist. Fix for crasher in Command applet. Change license to GPL3, as per the original project. Support building against Ayatana Indicators and Ubuntu Indicators alike.